Seafire is an Offshore 105. 34 ft long and licensed to carry 12 anglers. MCA 60 mile license. Fully equipped charter fishing vessel. 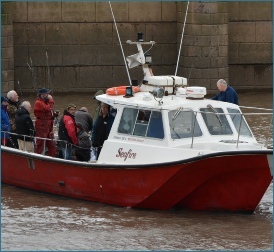 12 months Operational Sailing from Watchet Harbour. Individuals are always welcome. Skipper Shaun has been charter fishing out of Watchet for over 20 years. He is a very experienced Skipper and knows where all the best fishing spots are. The Bristol Channel is a great hunting ground, with good supplies of Cod, Tope, Conger, Smoothound, Bass, Rays and Wrasse. The Conger eel is found all round the British Isles, and other Northern European coastlines. It prefers rough ground, preferably a reef or a wreck, in depths down to about 100m. It grows to a maximum of 3m long and about 250-350lb in weight. In fact this weight is just a guess and maybe larger. Cod are found all around the UK, although being a cold-water species they are more common around in the autumn and winter, although some remain around the UK all year round, especially the smaller specimens. Like many species cod form into large, loose shoals when small but become solitary once they reach larger sizes. Although not considered large, or particularly fast, Tope can reach up to 195cm in length. Feeding on a wide variety of bony fish, squid and other elasmobranchs, Tope are primarily a coastal species, often found in shallow bays and estuaries. Bass are a highly sought after fish, and bass angling attracts some of Britain’s most committed anglers due to the fighting qualities and high reputation of this striking looking fish. A bass of 10lb or more would be a landmark catch for most anglers, although fish much smaller than this still provide plenty of sport.